The EnduraPRESS line of heat presses has won many happy customers since we introduced it four years ago. EnduraPRESS products offer superior performance, advanced digital LCD control panels, and outstanding value. They’re also backed by the SIGNWarehouse product support team, so peace of mind is built-in. We’ve developed the EnduraPRESS product line by staying engaged with our customers. One of the requests we received earlier this year was for bigger presses. Since SIGNWarehouse is all about helping you achieve your goals we now have two 16 x 20 clam shell heat presses in the EnduraPRESS CS Series. 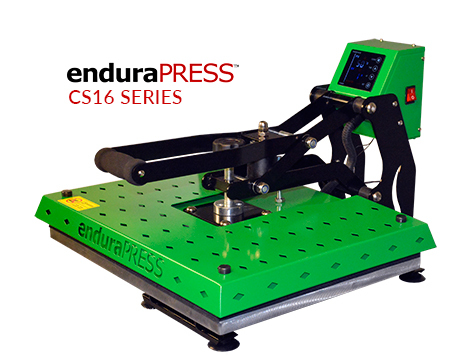 The EnduraPRESS CS16 and CS16-AR have been added to the product line. Here’s a quick introduction. For those new to the heat transfer scene, perhaps a formal introduction is in order. The EnduraPRESS line of heat presses is so successful because of its great value proposition. 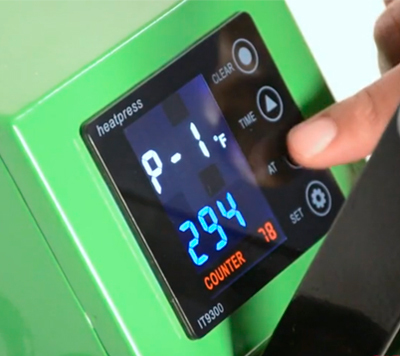 EnduraPRESS offers a digital control panel, and more accurate temperature output than ‘brand name’ presses that cost two or three times as much. They’re made in an ISO 9001 factory where a commitment to continuous improvement and attention to detail produces steady advances in features and quality. As noted above, we recently added the CS16 and CS16-AR. The CS designation indicates a clam shell design. Clam shell heat presses are good for all standard heat transfer applications where relatively thin, flat items are decorated. Think shirts, scarves, tote bags, and such. The 16 indicates that these are 16” x 20” clam shell heat presses, perfectly suited for grown-up commercial applications like league jerseys and spirit wear. The table and platen are in a landscape orientation which means that, when you face the press, it’s actually 16” deep and 20” wide. Let’s look at a few important features. We mentioned digital job control. One of the CS16 and CS16-ar’s best features is the digital touch-screen LCD control panel. It delivers essential information clearly and accurately. The digital temperature display is accurate to within 5– 10°. So there’s no guessing about how much heat you’re applying to the fabric. In addition to an accurate temperature display, the control panel gives you quick and easy access to cycle time, Celsius to Fahrenheit conversion, a programmable pre-alarm, and temperature display calibration, all accessible in seconds. It’s accurate so you don’t have to waste time wondering why your transfer materials won’t stick. And it’s easy so you don’t have to waste time trying to figure out how to use it. The traditional clamshell design is perfect for use in tight spaces because it takes up less table or counter space than a swing away press. Like all EnduraPRESS models, the CS16 series produces excellent pressure. At maximum pressure, it produces 1,000lbs of force or 8.3PSI, so you’re never at a loss for effective pressure. Thicker items like hoodies will amplify that so remember to reduce the pressure for thicker fabrics. The bottom table is threadable for large garments, and the CS16-AR comes with a magnetic auto-release mechanism that automatically opens the press at the end of the press cycle. The CS16-AR is a great choice for busy shops. You don’t have to stand and wait for the cycle to end. The CS16-AR also reduces effort and fatigue. With traditional manual clam shell presses, the more pressure you use to close it, the more difficult it is to open. Opening a manual clam shell press all day can cause fatigue. The CS16-AR solves that problem because the press opens itself. Just close it and forget it. Common uses for the EnduraPRESS CS Series heat presses include applying plotter-cut T-shirt vinyls, applying printable heat transfer film, and dye sublimation. The EnduraPRESS CS series are suitable for use with various standard weight fabrics and thin textiles like tote bags. Clam shell presses are not recommended for self-weeding laser transfer papers and they’re not the best solution for thick items like mouse pads, and ceramic tile. This is because clam shell presses exert more pressure on the rear of the table than the front. This can be a problem in these applications where even pressure front-to-back is important. I imagine the only questions you have left are how to get one and how to use it. How to get one is easy. Both are available online. The CS16-AR lives here and is yours for only $529.00 *. If the manual version is a better fit for your style or budget, you can order the CS16 here for only $499.00. Learning how to use one is just as easy because the User Manuals are also available online. You can download them from the product page at the links above, or click here for the CS16 manual and click here for the CS16-AR manual. Like all EnduraPRESS heat presses, they come with a one year warranty and qualify for SW Care Customer support. Folks loved the EnduraPRESS CS15, but asked for something a little bigger. We answered the call with two new 16 x 20 clam shell heat presses, the CS16 and CS16-AR. They offer the same features that made the CS15 and CS15-AR so popular; accurate readout, even heat distribution, and the same easy-to-use digital LCD controls. They come with the same great quality and the same excellent service and support. Now you get all of those great features in a format big enough for serious, commercial garment decoration. Same thing, only bigger.